As this is my first entry in ‘this is not a blog’ I figured why not start of by making a bold statement. I know there is no such thing as the greatest movie of all time, just as there isn’t one great book of all time. All books in general are great, that however can’t be said for all movies. Movies nowadays are laden with special effects combined with fast-paced-in-your-face action. This movie that I’m talking about does not contain a single second of special effects and by today’s standards (or perhaps even from its own time) can be considered extremely slow. This movie won 7 Academy Awards. This movie was released over forty years ago, many moons before I was born. Calling it long would be an understatement. The director’s-cut version is over 216 minutes – that over 3 ½ hours! Who would want to watch a movie that long, unless it’s another movie by Peter Jackson, which happen to have hobbits or gorillas? No. This movie has no such creatures or characters. It is neither fiction nor fantasy. It is based, perhaps loosely, on true events but those events are extraordinarily riveting. This movie has lots and lots of sand. It was shot in Jordan, Morocco and Spain, spanning over 2 years. It was shot in the most ungodly climates with temperatures that could boil, melt, and fry a brain. It was shot in the desert. Did I mention not a single frame is computer generated? This means all those desert scenes could not be created inside an air-conditioned room. It had to be on location, regardless of how devastating nature could be. Steven Spielberg, who, according to reports, watches this movie before starting working on each and every one of his films, has said if this movie was shot now it would cost over $300 million. This movie has lots of camels. It is a vision to see, with its long canvas scenes that fill the entire screen and evoke a sense of being there. It has perhaps one of the most beautiful and heart-stopping scores ever written. At the time it contained an ensemble cast that was the envy of it’s time. It has action sequences that would rival any movie today, excluding those with computer special effects, of course. It has a script that is top notch, with dialogue that sticks in your memory for a long, long time. This movie has Peter O’ Toole, Alec Guinness, Omar Sharif, and Anthony Quinn. By now you’ve guessed which movie I’m talking about, unless you’ve spent your entire life with no TV, no magazines, no newspapers, no movies, no internet, no nothing. In short you’ve been living underground like a mole and have just come out and somehow stumbled upon this website (how you learned to use a computer or the internet I don’t know). 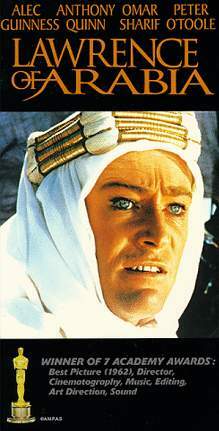 This movie that I think is the Greatest Movie of All Time is…David Lean’s masterpiece Lawrence of Arabia.